The mobile payment workshops at Apps World 2014 will be looking at new business models and discussing the latest developments in the mobile payments space — emerging technologies, mobile commerce, monetisation, security, NFC, mobile banking — and how these will affect the roles of key industry players like banks, operators, platform owners and card issuers. Entry to the exhibition is completely free. 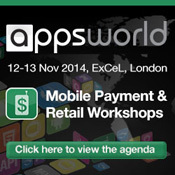 Mobile payments workshop passes start from £495 — save 15% using the discount code SPA15. To find out more about Apps World and how to register click here. Organised by Six Degrees Events.